Spring is in the air! That means spending more time outside, for both dogs and kids. 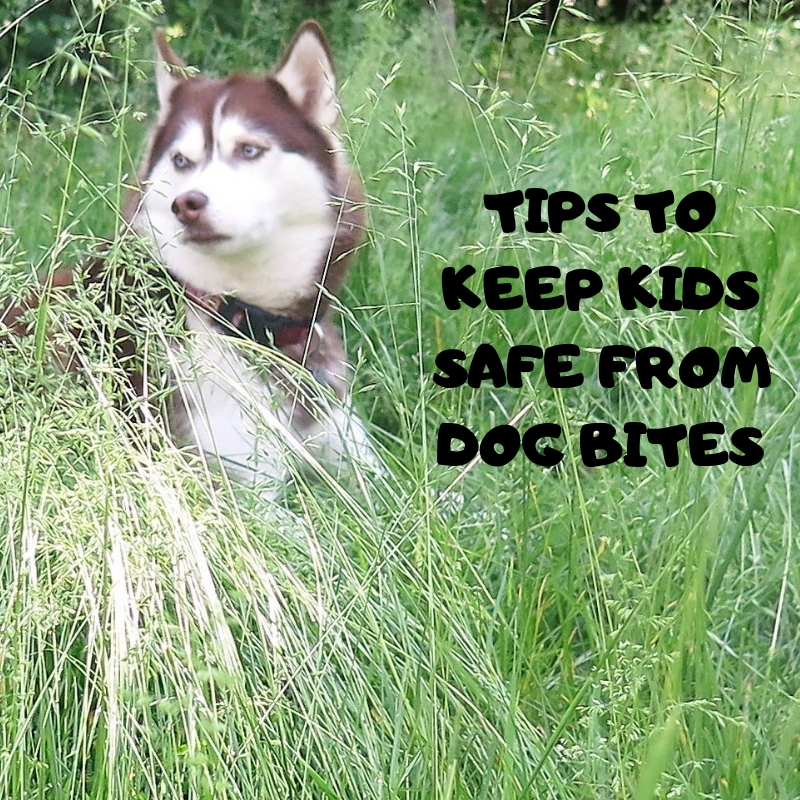 It's a great time to reinforce child safety around dogs. Kids and dogs can be great friends. However, children should be taught how to safely approach a dog and how to interact safely with dogs to help prevent dog bites. According to a study by the Center for Disease Control (CDC) approximately 4.7 million dog bites occur each year in the U.S. and nearly 1 in 5 dog bite victims need medical attention. According to the American Veterinary Medical Association (AVMA) Children are the most common victims of dog bites, with over half of dog bite victims being 14 years old or younger. Aside from causing painful injury and being traumatic, dog bites can spread germs and cause infections, such as rabies and Tetanus. These statistics demonstrate the importance of teaching your child how to recognize stress in dogs and how to safely interact with a dog. Know the signs yourself as well and always supervise interactions between your kids and dogs. 🐶 Dog is moving away when you try to pet or hug him. He clearly doesn't want to be pet, leave him alone! 🐶 Snapping - If a dog snaps at you, immediately walk away. A snap is often the step before a dog bite. 👧 Don't run up to a dog, it can be scary to dogs and could be mistaken as a sign of aggression! Approach calmly and quietly and allow the dog to sniff your hand before attempting to pet him. 👦 Don't approach a dog yelling or squealing in high pitch tones, as many kids like to do. That can be scary to a dog and could be mistaken for aggression. Approach calmly and quietly. Allow the dog to sniff your hand before attempting to pet her. 👧 Never, ever pull a dog's tail! 👦 Never jump on a dog's back or try to "ride" him, no matter how small the child is or how big the dog is! 👧 Don't approach a dog when he is sleeping, eating or has a chew stick or toy in his mouth. Never try to take anything out of a dog's mouth! Ask an adult for assistance. 👦 Never approach a strange dog without asking the owner first. If no owner is present, stay away. 👧 Instruct children to also ask their own parent or guardian for permission before approaching a dog's owner to ask to pet their dog. Parents or guardians should accompany kids when they approach someone's dog and supervise the entire interaction. Follow these dog bite prevention tips whenever you encounter someone else's dog. They can help significantly reduce the likelihood of your child being bitten by a dog. Do you have any other Dog Bite Prevention Tips to share? Please share them in the comments, we love hearing from you! Is your dog at risk for Anaplasmosis (Tick Fever)? If you read my blog regularly, you've probably figured out that dog friendly vacations and great dog friendly hotels are my world! I love sharing the adventures we go on with our dogs, Icy and Phoebe. When we first started traveling with the dogs and I had to plan pet friendly getaways, it helped me a lot to read about how other pet parents found great places to visit with pets. 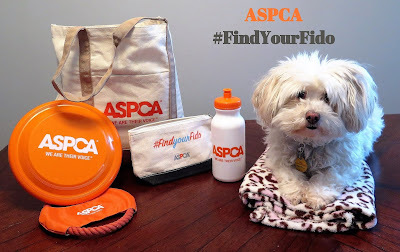 It isn't always easy to find great pet friendly hotels and activities. We've been traveling with our dogs for several years, and now we're in the pet travel groove! We have shared many of our wonderful dog friendly adventures on this blog, and we'll continue to do so to help others plan their own great pet friendly vacations! 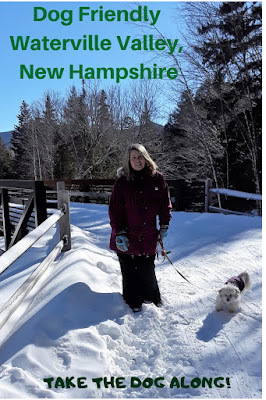 Our latest travel adventure with Icy and Phoebe was a trip to the Waterville Valley, New Hampshire ski resort. No, the dogs didn't do any skiing, I did! 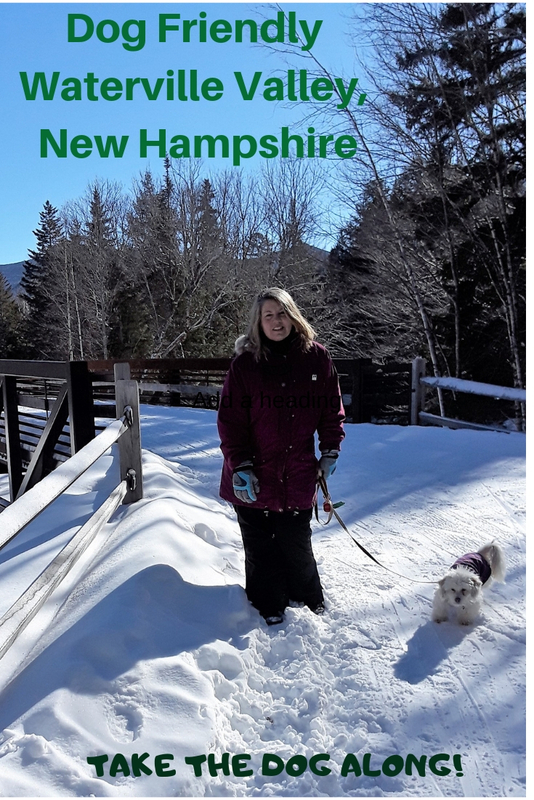 New Hampshire is one of six states that make up New England, and it's one of my favorite New England states to visit. The other states that make up the New England region in the Northeastern United States are; Maine, Vermont, Rhode Island, Massachusetts and Connecticut. All these states are beautiful in every season and each one has something special to offer. However, we love New Hampshire the best, in both Winter and Summer. Waterville Valley is one of the best dog friendly vacations we've been on, so we go back as often as we can. 🐶 Of course, the very best thing about Waterville Valley for us is that they are dog friendly! 🐶 In the middle of the resort is a charming little town square, with a few restaurants and stores around it. There's also a live web cam in the middle of the square, so you can sneak a peek at the town square action anytime. There's a live web cam at the base of the ski area's mountain too. We're such geeks, we love checking out the live webcams for weeks before we go, to see how the snow looks and how crowded it is at the mountain! Click here to see the Waterville Valley live webcams, called "Mountain Cams" (I Love that!). ⛷ One of the beautiful cross country ski trails runs right behind town square. It allows both foot traffic and (leashed) DOGS! The trail is gorgeous and has a few bridges over babbling brooks as well as a really cool tunnel that goes underneath the main road. We've had some fabulous long walks with the dogs on this trail. It's actually one of the things that keeps us going back! ⛷ The ski resort offers both cross country and downhill (Alpine) skiing. This is great for us, because I downhill ski but my husband cross country skis. We take turns skiing and watching the dogs so it works out perfectly for us! Believe me, it's not easy to find a ski resort that has both types of skiing, and is dog friendly. 🐶 Within the resort, there are a few pet friendly apartments for rent but you have to book early as they fill up fast. There's only one pet friendly hotel in the resort, but it's a real dive and typically has awful (well deserved) TripAdvisor reviews. You can read more about our Trip to Waterville Valley two years ago when we stayed there. It was one of the worst hotel stays I've had! What a shame, they could do so much more with that piece of prime Waterville Valley real estate. Seeing dog friendly signs like this one on vacation makes me smile! 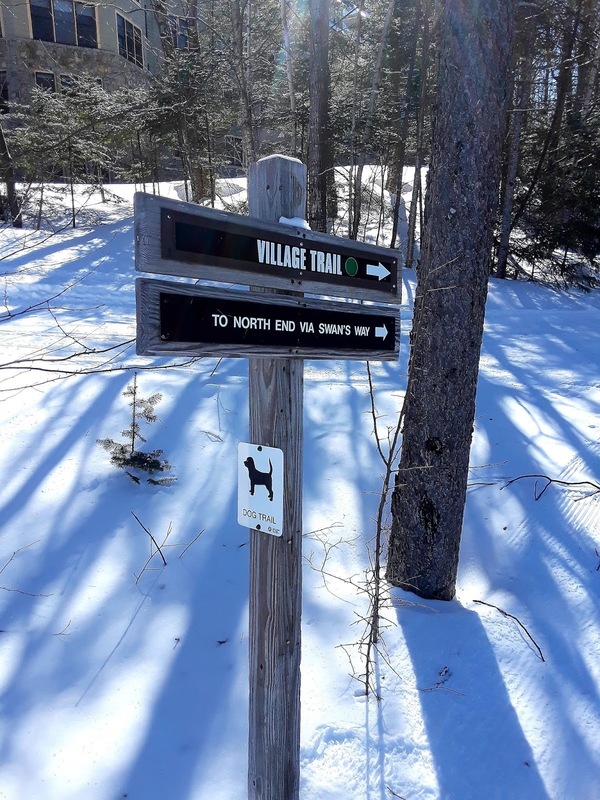 The first time we went to Waterville Valley and I saw this trail marker it made my heart sing! I'm so used to seeing No Dogs Allowed signs in so many places, it's refreshing to see a beautiful vacation resort that actually welcomes dogs! A ski resort that has both alpine and cross country skiing and it's dog friendly!? Um... Yes, Please! No need to leave the dog home, bring her along on that fabulous ski vacation! 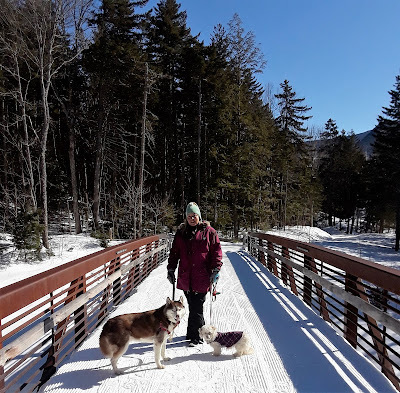 We have fun hiking for an hour or two on this cross country ski trail that allows dogs. It's one of my favorite things to do at the resort, and needless to say the dogs love it! 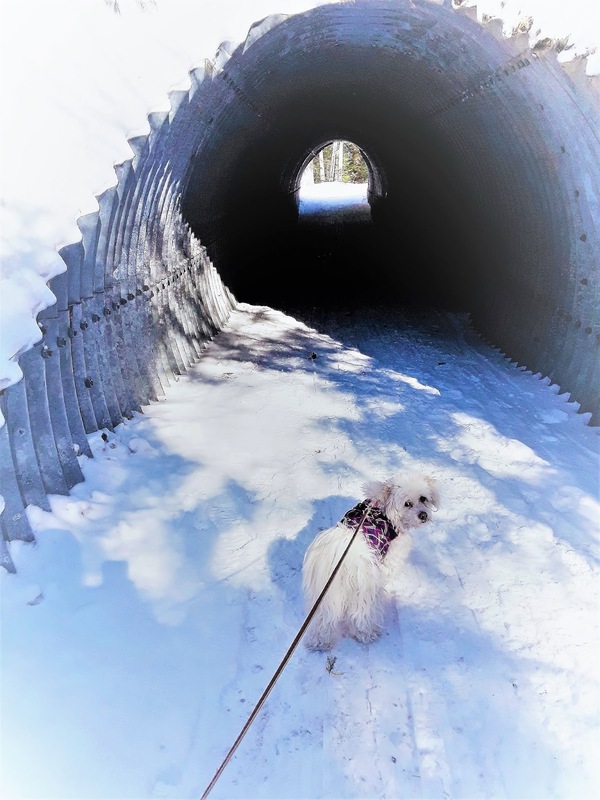 Into the Tunnel of Love with Phoebe! It isn't always easy finding the right accommodations for both you and your dog. On this trip to Waterville Valley we didn't plan early enough. As I said earlier, there is only one pet friendly hotel in the resort and it's awful. I will never stay there again. I checked the resort's private vacation rentals to find an apartment or condo that would accept dogs. There were several pet friendly accommodations but only a few were still available. Most of them are larger and geared towards families. We didn't need a place that sleeps 6+ so there was little available. However, after much searching we happened upon the Fairfield Inn and Suites in Plymouth New Hampshire. This hotel is owned by Marriott Hotels and is about 18 miles from the Waterville Valley ski area. It seemed like an OK option at the time, not right in the resort but it was feasible. Well, it turned out the be a fabulous find! 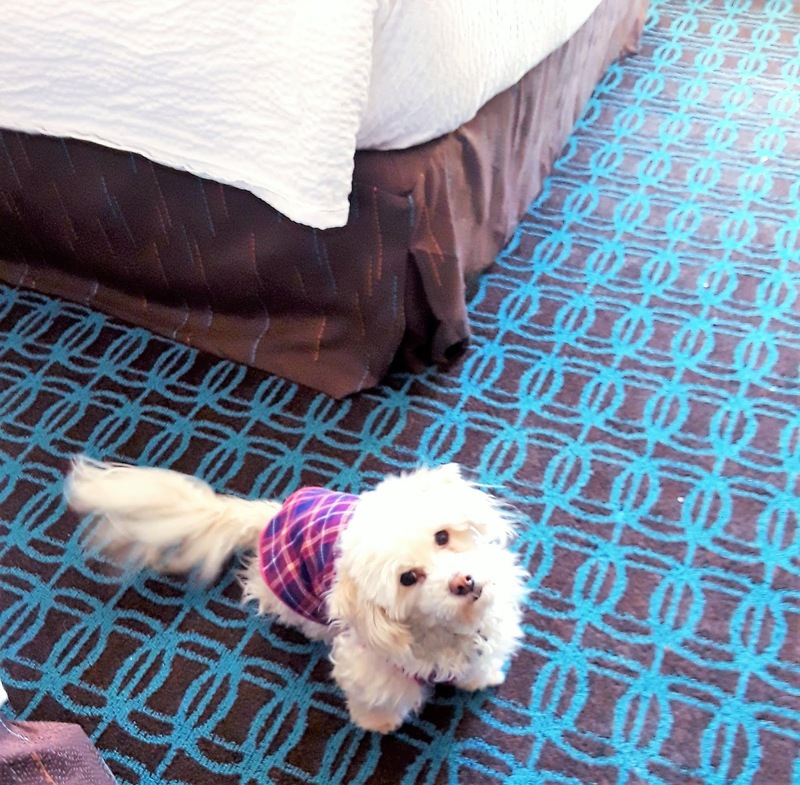 Phoebe was very happy and comfy in our Fairfield Inn and Suites hotel room! The Plymouth, NH Fairfield Inn and Suites hotel is fairly new and totally updated. It was super clean and the staff was really nice, especially the General Manager. The rooms have a microwave, fridge, and coffee maker. The bathroom was wonderful, clean and spacious with plenty of hot water in the shower! They didn't hit us with a million rules about what our dogs can't do at the hotel, they simply welcomed us. The icing on the cake, and something we didn't know about beforehand, is that this hotel offers discounted ski lift tickets for Waterville Valley! I paid only $41 for a Mid-Week full day lift ticket. The regular price of a Mid-Week lift ticket is $79! That is a fabulous savings, and well worth the 18 mile drive to the ski area. Dog Approved! 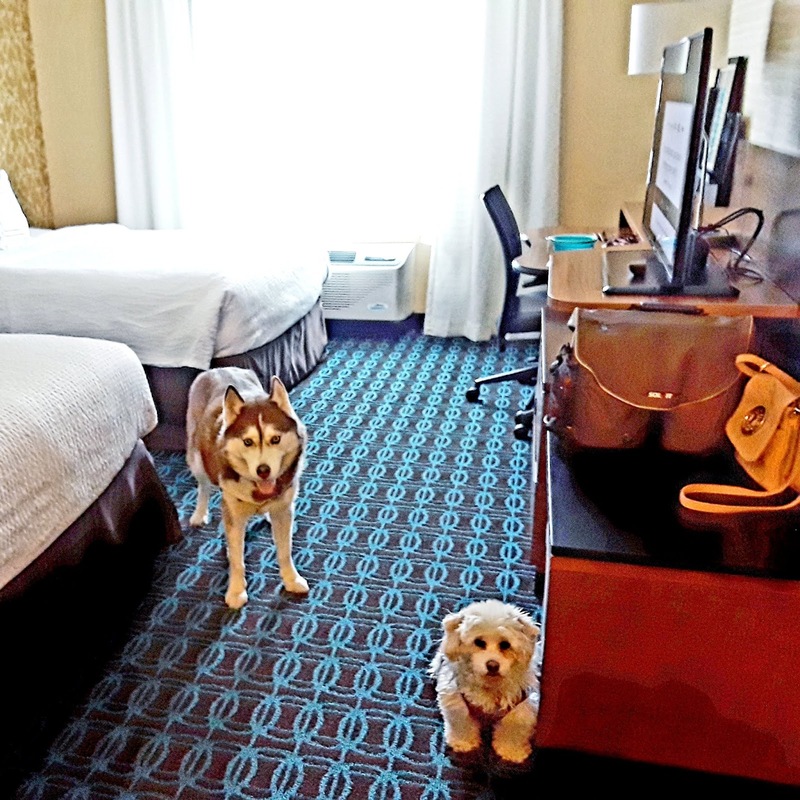 Icy and Phoebe loved our room at the Fairfield Inn and Suites! They were so comfortable and happy there. Waterville Valley is as beautiful in Summer as it is in the Winter. I'm already planning our trip back this Summer. I look forward to doing lots of hiking with the dogs up there. Icy and Phoebe, Get Ready for more New Hampshire adventure! What is one of your favorite pet friendly vacation destinations? Tell us in the comments! Here on Long Island, New York, we've had a fairly mild Winter in terms of snow. Lots of colder weather and rain but very little of the white stuff. My dog Icy was not pleased. 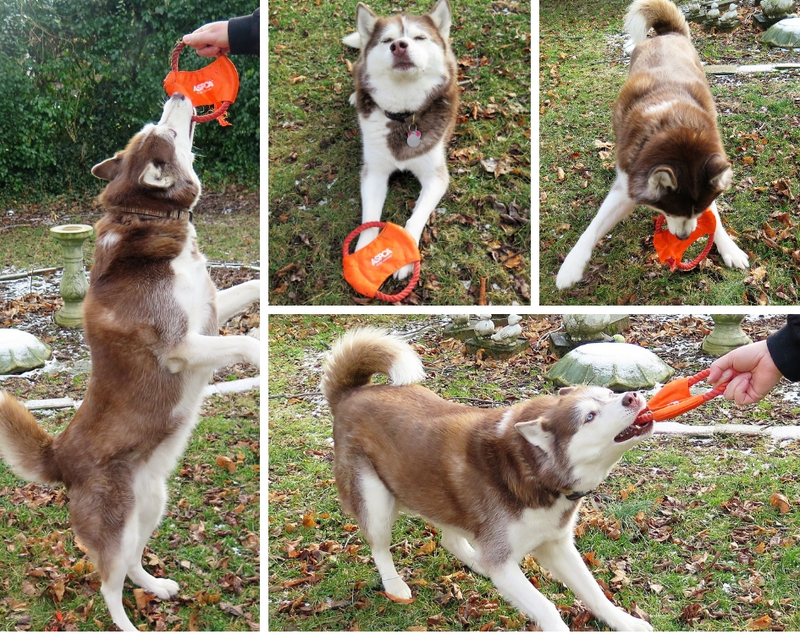 Being a Siberian Husky, she lives for cold weather and SNOW, which is why Huskies are often called "Snowdogs"! Fortunately, last weekend Mother Nature obliged and finally delivered over 5 inches of snow for Icy's Snowdog pleasure. Here are some fun photos of her and Cooper, Icy's Golden Retriever love interest, enjoying a romp in the snow. This photo is my favorite. 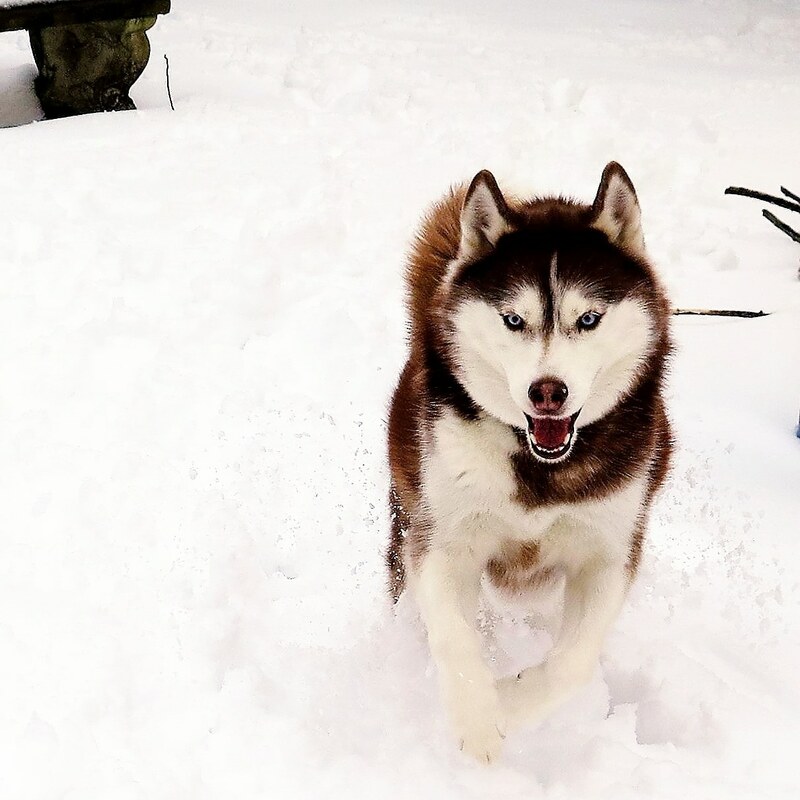 Icy is so excited to play in the snow, she looks like a wolf rather than a dog, don't you think? Siberian Huskies tend to be a lot more energetic than most dogs. When you see them playing it sometimes looks like they're playing rough. Icy doesn't have an aggressive bone in her body, but when she plays she is pretty rough and tumble. Both dogs are 9 years old now, and Cooper has slowed down considerably. Not Icy though, she's as energetic and rambunctious as when she was a puppy! Here's Icy saying "C'mon Coop, let's get wild in the snow like we used to"! And Cooper is looking at her like "Haven't you had enough yet, you crazy Husky?" In the end both Cooper and Icy finally relax after a fun romp in the snow they've waited so long for! How about you, have your pets played in the snow this season? Tell us about it in the comments - we Love when you Woof back at us! Join us on the FLASHBACK FRIDAY BLOG HOP, hosted by our friends at the FiveSibes blog! My very favorite photos, including this one, are the ones taken in Sedona, Arizona when we lived in Phoenix. 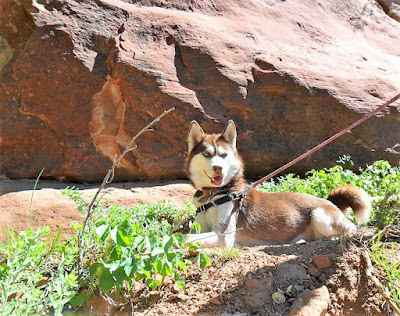 The dog friendly hiking in Sedona is incredible! Join us on the Friday Flashback Blog Hop! 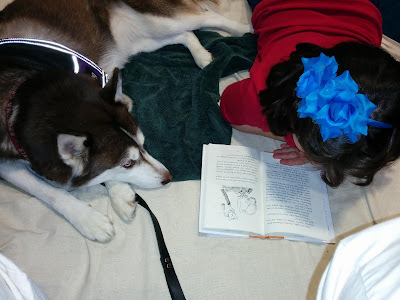 As most of my regular readers know, my Siberian Husky Icy and I are a Therapy Dog team. We've been volunteering as an animal therapy team since 2012 in Phoenix, Arizona and across Long Island, New York. There is nothing I love more than giving back to my community with my dog by my side! It's the most rewarding thing I've ever done. 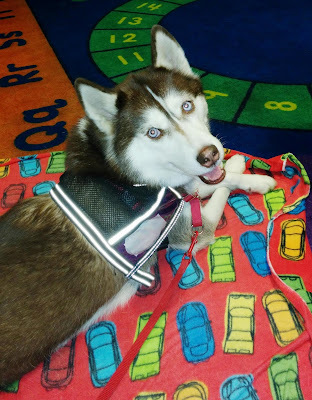 Over the years I have learned a lot about how to successfully manage a facility therapy dog program in libraries and schools. I'd like to share my personal insights to help both people who run therapy dog programs, or plan to start one, and for people whose children may benefit from a therapy animal program. I have visited many libraries and schools and they are all run differently. Most animal therapy organizations allow their member facilities to run their programs in the way that best suits them and their customers. The guidelines facilities must follow to remain in compliance usually don't include guidelines around the physical space they chooses to use for the program, or exactly how they manage the animal therapy visits. That is both good and bad. It's nice to have the flexibility to manage the program in the way that best meets the needs of their participants, but some facilities do a better job of making pet therapy visits more enjoyable and effective. Let me share some examples and tips with you. One of my favorite visits (and Icy's too!) is the Reading To Dogs programs at the library. 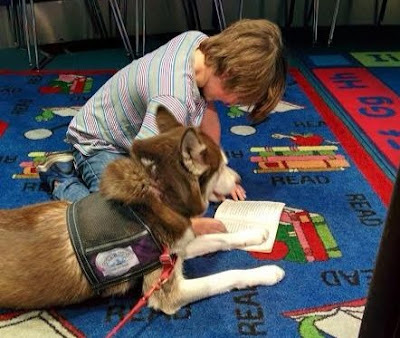 During these visits children read out loud to dogs, which gives them an opportunity to practice their reading and improve reading skills in a safe, non-judgmental environment. I'm not grading or correcting them and Icy doesn't care how well they read, as long as they'll give her a few pets and maybe a belly rub! Learn more about Reading To Dogs programs for kids in this earlier post. At one of the libraries we visited in Phoenix, the program was very unstructured. We showed up with our dogs, signed in, and were told to "just find a place to sit and we'll send the kids to you". If you've ever seen a dog in a library, you know how excited kids get when they see a dog there. They can't help themselves, they invariably come rushing over to pet the dog and start asking questions. They are oblivious to the fact that you're conducting a therapy dog reading session. One of my favorite photos of Icy reading with one of the kids at the library. She looks so interested in doesn't she?! One day Icy and I arrived at the library and found a tiny corner. The first child sat down to read to Icy but almost immediately, another kid came running over, excitedly yelling, and plopped down to pet Icy and begin asking questions about her. Needless to say, the child that was reading to Icy was very put off and he immediately shut down. The second kid's grandparent came over but seemed oblivious to the fact that this was a one on one reading session. I finally had to gently suggest that he come back after the first child was done reading. There wasn't a library staff in sight to oversee the program or help in any way. I went to this library twice before I became discouraged and never returned. This type of environment puts the therapy dog handler and the kids who want to read in an awkward position. It's not a pleasant or effective experience. 🐶 They had a separate room for the visits and set it up perfectly. There were no more than 3 dogs at any one time and the sessions were one child at a time reading to a dog. For kids who struggle with reading, group reading sessions can be stressful and unpleasant, lowering their confidence. Here, each child had one on one time to read and interact with the dog in a non stressful environment. 🐶 Kids signed up in advance for the program and waited outside the room for their turn to read. No other kids interrupting or making the child uncomfortable. 🐶 At the end of their 15 minute reading session, the child was given a lovely printed certificate that said "I read with Icy today!" The kids loved the certificates, it gave them a sense of accomplishment and pride. 🐶 They didn't allow therapy dog handlers to give out candy or other edibles to the children, which is smart. Sticky fingers and books are not a good combination! Parents also don't appreciate their kids being randomly given sweets or other foods in the middle of the day. They did allow us to give out stickers, which the kids loved. One or two fun stickers for each child adds a nice touch and feeling of pride and accomplishment to a therapy dog visit. 🐶 They Paid Attention! If kids started entering the room, crowding a dog, or squealing in high pitch tones they stepped in. They didn't just leave the handlers alone to supervise the groups of children who participate in the program. The handler's responsibility is to their dog. They shouldn't be left to their own devices to manage groups of children in a facility. 🐶 They had books available for the children to select to read. They also obtained input from local elementary schools on books that should be offered. I miss that library and their staff so much! Of the many libraries we've visited as a therapy dog team, that one was my favorite. 🐾 Ensure therapy dog handlers don't bring any dog treats or food that contains nuts. Dogs love peanut butter treats but they should be left at home. There are so many kids with nut allergies! 🐾 Always have someone manage both the participant's signup process and the room. Don't let kids just walk in and sit down. Explain to a parent or guardian what the program is, how it works, and ask them to sign up. 🐾 Manage the visits! Be there to support the therapy dogs and their handlers, who are volunteering their time to help you and the kids at your facility. If a child starts crying uncontrollably, becomes frightened of the dog, wanders out of the room, or acts out please step in to help. It's unfair to leave therapy dog handlers to be responsible for a child that wanders off or to handle behavioral issues. 🐾 Remember that the handler's first responsibility is to their DOG. They will explain to a child how to best pet and interact with their individual dog, and they will help a child with a word or sentence if they need it but they are not teachers or babysitters. I have seen parents drop their kids off to read to the therapy dogs at the library and not return for well over an hour! 🐾 Have a cart or table with a large variety of books available for the kids to read. Many times a child selects a book that is either way above or below their level, or they just don't like the book they chose. When they have to run out of the room and search the shelves for another book, they run out of time. Have plenty of books to choose from within easy reach. 🐾 Try to limit therapy team visits to one hour, and kids' reading sessions to approx. 15 minutes per child. Most dogs become tired or need a break after an hour. Being a therapy dog is very mentally stimulating for the dog and they can get tired, or sometimes they've just had enough. If a handler feels the need to leave early or give the dog a break by leaving the room or walking outside, please respect that. The handler's biggest responsibility is to advocate for their dog. Part of that is to know when their dog is becoming stressed or has had enough. Just like people, dogs have good days and bad days. Please don't be offended! Another adorable photo of Icy reading with a child. I get a kick out of her putting her paw on the book! I hope you have found these tips helpful. 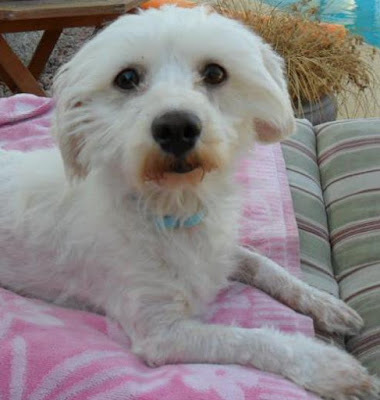 By following these tips your pet therapy program should run smoothly for everyone! Have you ever run or participated in a therapy animal program? Please tell us what your experience was like in the comments! Lack of oral care in dogs can lead to dental disease, which in turn can lead to more serious health issues. Good oral health for dogs (cats too!) goes beyond just whiter teeth and fresh breath, it's important to your dog's overall health as well. 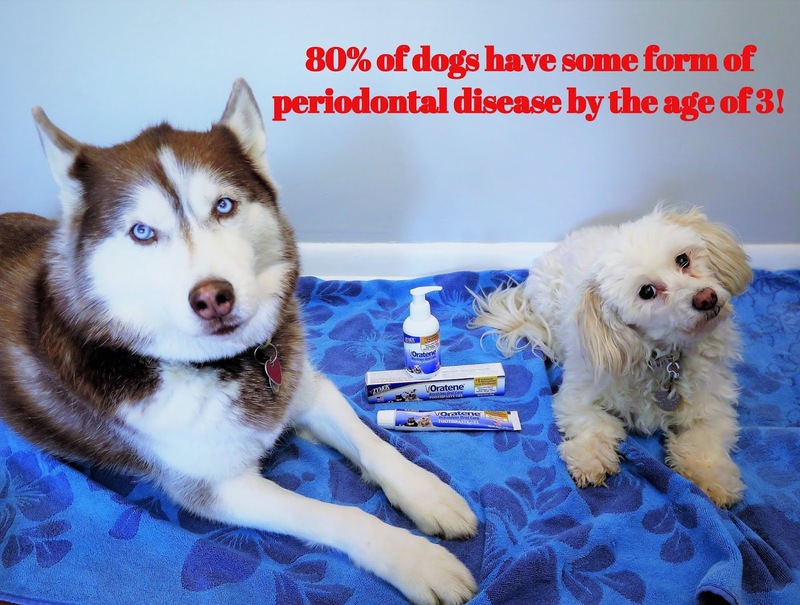 According to the American Veterinary Medical Association (AVMA), 80% of dogs have some form of periodontal disease by the age of 3! That number for cats is not much better, at 70%. Good oral hygiene in dogs can help prevent dental disease. Periodontal Disease can lead to even more serious health problems. 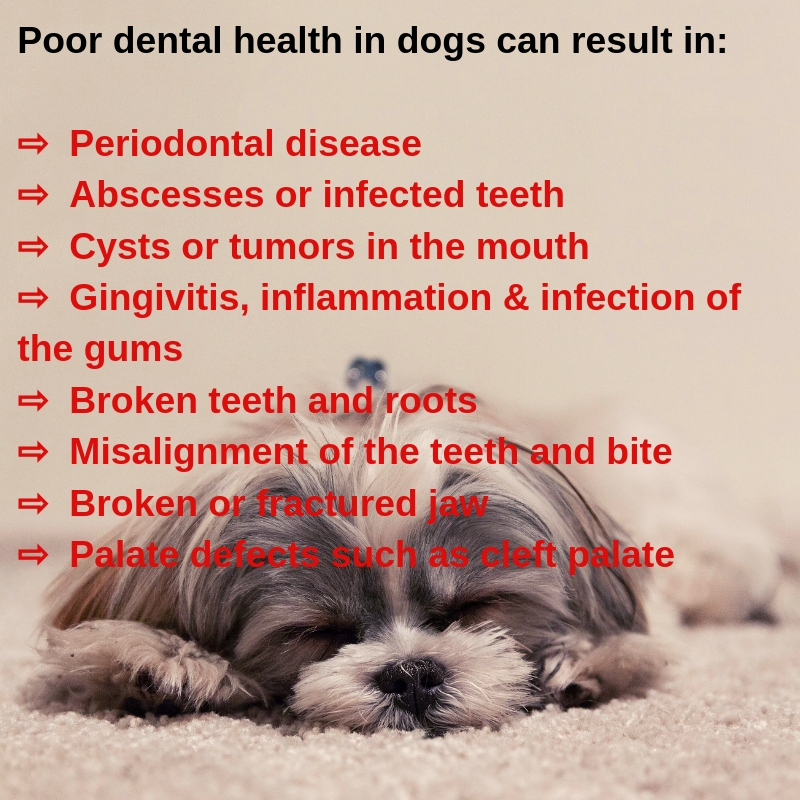 Toxins from periodontal disease get absorbed into the dog's blood stream and can cause infections in the body. This can potentially damage kidney, liver, heart, and brain tissue. This post is sponsored by Zymox. I am being compensated to help share information about Oratene® Brushless Pet Oral Care products. We only share information we feel is helpful and relevant to our readers. Pets taking medications are especially prone to dental health issues. Many pets taking medication can experience a change in the quality of saliva. Although pets may still have saliva and drool, this condition is called "Dry Mouth". Pets with chronic Dry Mouth develop severe halitosis (bad breath), and accumulate plaque which can lead to tartar and tooth decay. Oratene's line of Brushless Pet Oral Health Products kill harmful bacteria and germs, and remove plaque biofilm in your dog's mouth. Tartar can throw off the balance of normal, healthy microbial flora in a dog's mouth. Oratene Brushless Oral Care products break down plaque and biofilm, and specifically target the harmful bacteria and microorganisms in the mouth. They help maintain a healthy oral ecology, and freshen your dog's breath. Oratene products are especially beneficial for senior pets, pets with special health conditions like Diabetes, and pets who are taking medications for behavior, pain, allergies, heart problems, thyroid dysfunction, or urinary incontinence. One of the products in their line of pet dental care products is the Oratene Brushless Oral Care Water Additive. It's a flavorless concentrate you add to your pet's water each day that provides a safe, healthy way to conveniently keep teeth clean without brushing! Just add two pumps of Water Additive to 4 cups of water daily. Dogs' teeth need attention in order to prevent plaque from hardening and turning into tartar on the teeth. Although brushing your dog's teeth every day is ideal to ensure good oral hygiene and ward off dental disease, not everyone can commit to that. And many pets, if they're like my dogs Icy and Phoebe, will not tolerate a toothbrush in their mouth! Believe me I've tried but it's just not feasible for us. 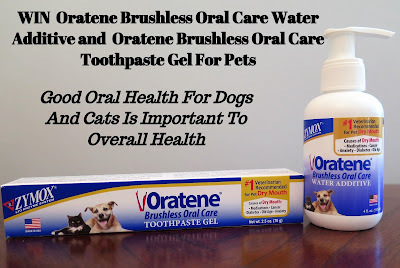 I use Oratene Brushless Oral Care Water Additive in their water and Oratene Brushless Oral Care Toothpaste Gel to keep my dogs' teeth clean and healthy. Yes, I said BRUSHLESS! These videos show you how easy it is to use both the water additive and the toothpaste gel. Although my dogs don't take medication and don't have "Dry Mouth", they are both 9 years old and have shown signs of deteriorating dental health. I've been using Oratene water additive and Oratene brushless toothpaste for a year or so and it's been really helpful. Trying to brush Icy and Phoebe's teeth was just not working, but these products are effective, easy and convenient to use, and my dogs don't mind them at all, which is half the battle! Note: According to Oratene, the Water Additive can be used with a pet water fountain however "the filter MUST be taken out or it will remove the active compounds and it will plug up the filter." HOW DO ORATENE BRUSHLESS ORAL CARE PRODUCTS FOR PETS WORK? > Oratene brushless pet oral care products contain two patented, natural enzyme systems, the LP3 Enzyme System and the MD2 Enzyme System(Mutanase + Dextranase). > Oratene oral care products do NOT contain CHLORHEXIDINE, XYLITOL, ALCOHOL, OR CHLORINE COMPOUNDS, so it's safe for dogs and cats to use daily! 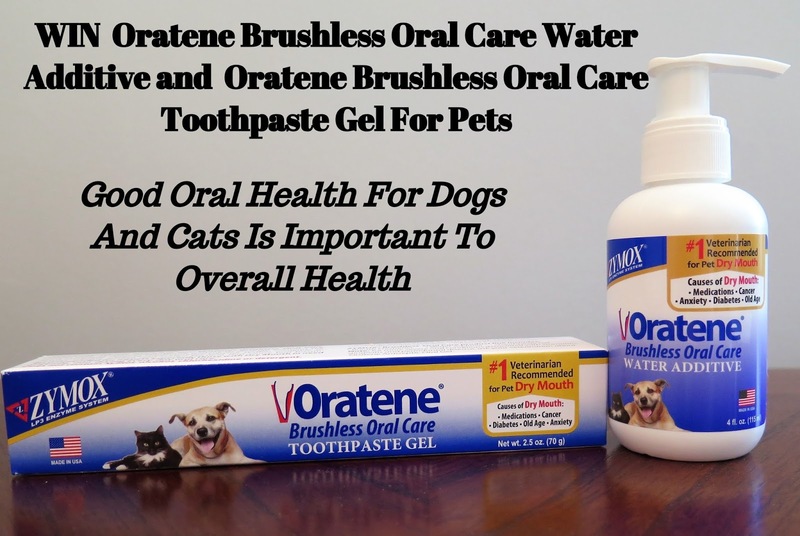 Enter the Giveaway to WIN a bottle of Oratene Oral Care Water Additive and a tube of brushless toothpaste for dogs & cats! WIN THESE ORATENE BRUSHLESS ORAL CARE PET DENTAL HEALTH PRODUCTS by ZYMOX! We should always keep our pets dental health top of mind but National Pet Dental Health Month, Sponsored by the AVMA, helps raise awareness of the significance of oral healthcare for pets. VISIT ZYMOX ON SOCIAL MEDIA & LEARN MORE ABOUT PET DENTAL CARE AND ORATENE PRODUCTS! You may also want to try Zymox Itch Relief Shampoo & Conditioning Rinse to calm and sooth itchy skin. When the holidays roll around we know it's going to be a busy, stressful time so we try to plan an early pet friendly holiday getaway with the dogs. We usually go the first few days of December, when holiday decorations are up but before the holiday crowds are in full swing. 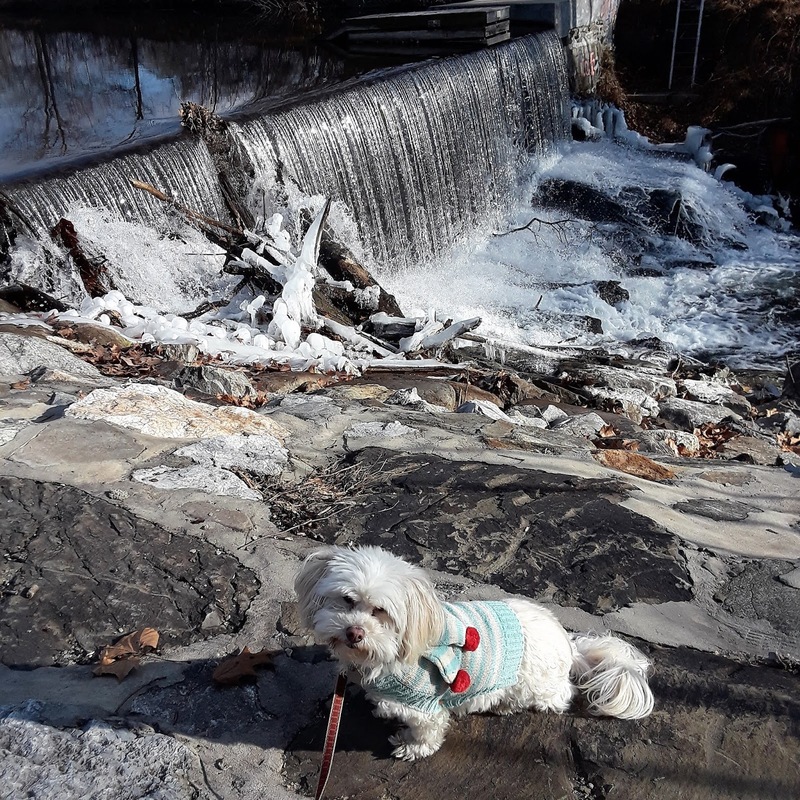 This year, our dog friendly holiday vacation was a few days in the quaint upstate New York town of Rhinebeck. We love to vacation with our dogs, they are our family, so it was disappointing that we could never take them with us. 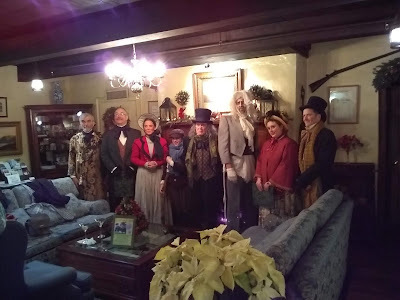 I understand why pets are not permitted in the main Beekman Arms Inn or the Delamater House because they are historic inns with upscale furnishings and antiques. I really can't blame them for not wanting dogs or cats in those unique and special hotel rooms. 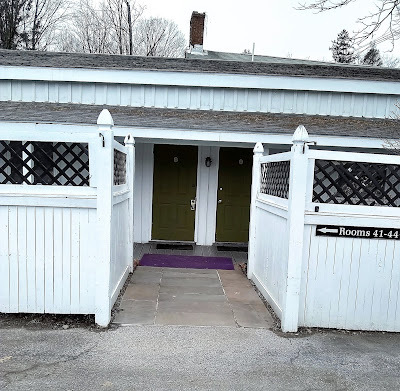 The Beekman Arms does have one building that allows pets, it's called the Guest House, and is described as a "motel style" hotel on property. We were never able to find photos of this building or their pet friendly rooms online in the past, they just didn't have them which made us suspicious that they might be hideous. 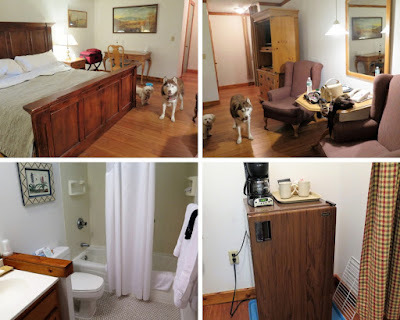 Recently though, we found a photo of a dog friendly room at the Guest House on the web site and it didn't look bad at all! We decided to take a chance and book a dog friendly room in the Beekman Arm's pet friendly Guest House property. We were pleasantly surprised. It was a far cry from the beautifully appointed rooms of the main Beekman Inn and the Delamater House, but we really enjoyed staying there. It was wonderful having our dogs with us in one of our favorite quaint upstate towns. The pet friendly Guest House building at the Beekman Arms in Rhinebeck, New York. There's actually a cute courtyard area behind this fence, I'm sorry I didn't get a photo of it. The Guest House at the Beekman Arms doesn't look like much from the outside. It's definitely more "motel style", but it was clean and comfortable. 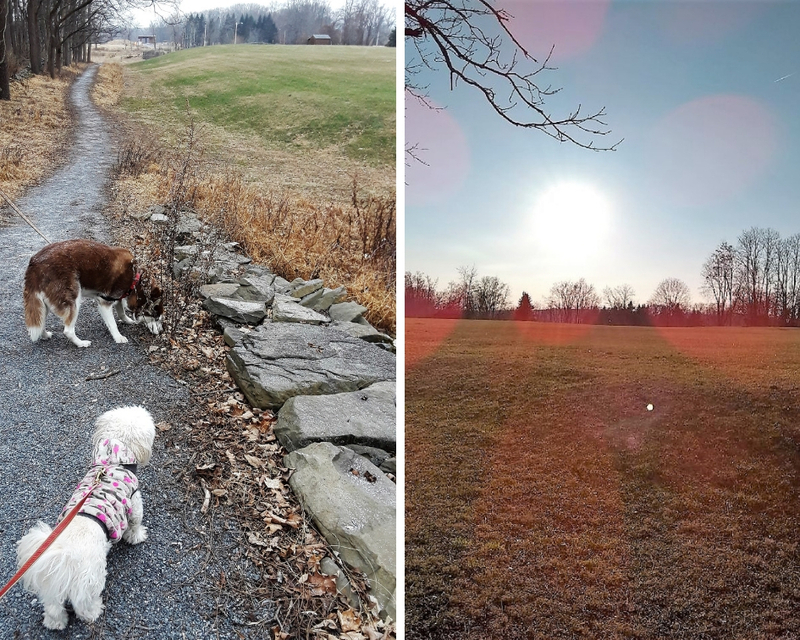 We were so delighted to be able to finally bring our dogs with us to Rhinebeck! There don't seem to be any other dog friendly lodgings in the town of Rhinebeck. Here's a photo collage of our dogs Icy and Phoebe in our Guest House room. GREAT WALKABILITY AND DOG FRIENDLY! 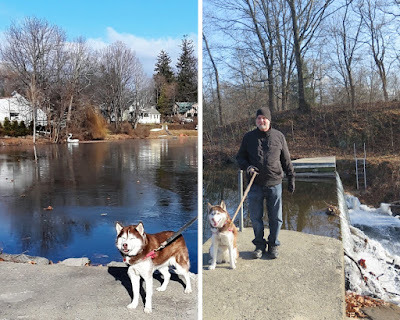 Having our dogs with us on our Rhinebeck getaway was great. We loved being able to walk through and around this beautiful little town with them. The sidewalks weren't too crowded and there were several places for both the dogs and us to enjoy together. 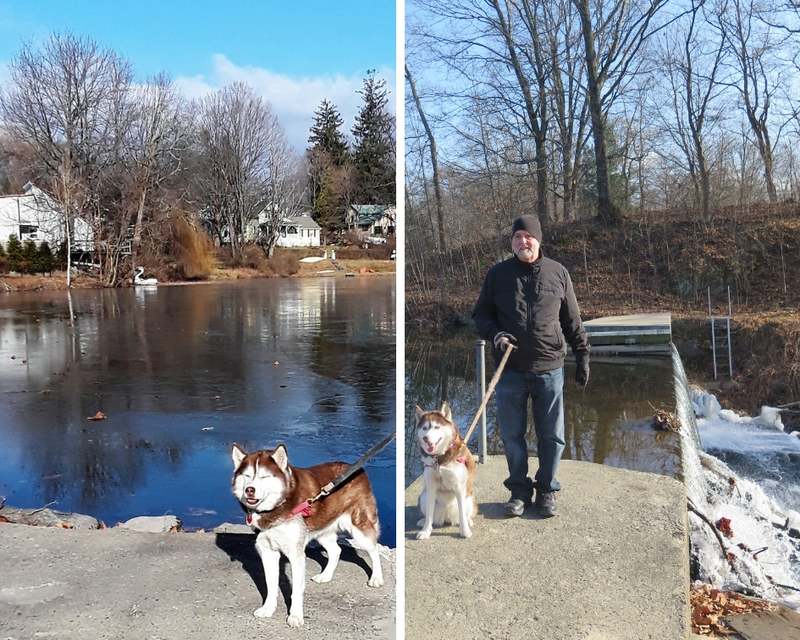 There's a lovely little park with a lake at one edge of town, which Icy and Phoebe loved exploring. The lake runs off into a creek with a waterfall that was partially frozen. Just steps from our hotel room we discovered another great dog friendly park with a gravel walking path and a large grassy field. Each morning and evening we went for nice long walks with the dogs here. It must be gorgeous when it snows. Unfortunately it's not an off leash area but we enjoyed it so much. 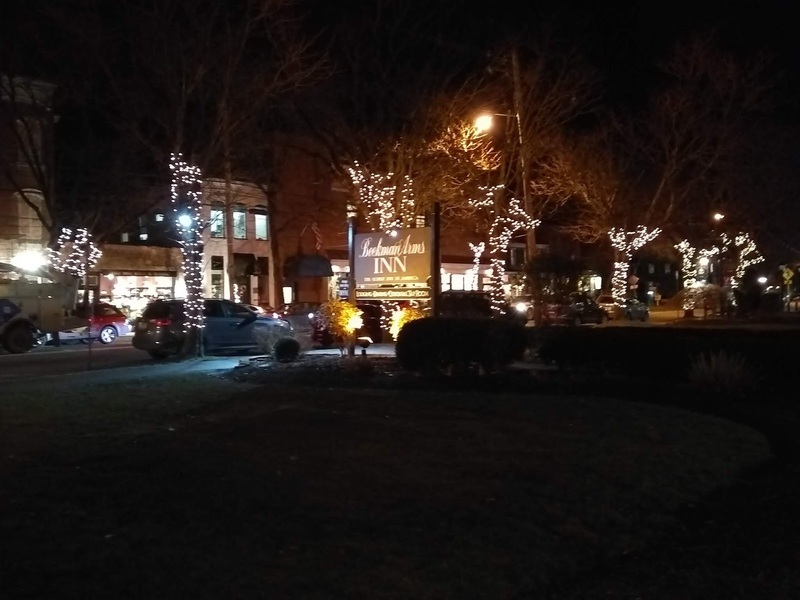 The town of Rhinebeck and the Beekman Arms hotel were beautifully decorated for the holidays. This wonderful antique sleigh stood right outside the Beekman Arms Inn so we took advantage of a photo op for Phoebe. Too bad there wasn't any snow, maybe we could have gone for a sleigh ride! What, we're not going for a sleigh ride?! At night the streets were all lit up with beautiful Christmas lights. It was so nice to stroll through the town in the evening enjoying all the lights. I love Broadway shows in New York City, but I really enjoy dinner theater too. Great food and a show at the same time - I love it! A wonderful theater company performed A Christmas Carol in dinner theater style and sang Christmas carols in the Beekman Arms hotel. We loved it! The actors and singers were all so talented. The little boy who played Tiny Tim was such a talent, I won't be at all surprised if I see that kid on broadway one day soon. I hope you enjoyed this post. We love sharing our dog friendly adventures and all the great pet friendly hotels and other places we've taken Icy and Phoebe to. If you're interested in other dog friendly vacations and pet travel tips, check out more of our Dog Friendly Travel posts. 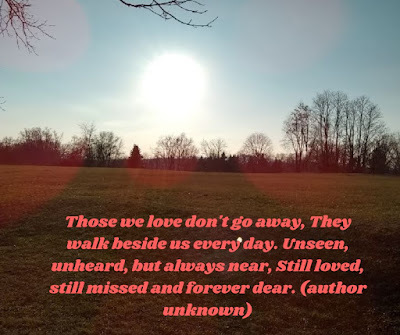 Remembering all the great trips we've taken with our dogs, today we're joining the FiveSibes Flashback Friday blog hop, hosted by our friend Dorothy Wills-Raftery of the blog FiveSibes. Discover new blogs & link up your own if you're a blogger too!